Only two of those 53 are stock colors! Your results will vary depending on several factors, including the condition of the book and the advertised price at the time of sale. Now, this avian Vatican also has its own Michelangelo. Moreover, our understanding of the avian family tree is subject to frequent changes requiring constant adjustment—a circumstance that applies not just to extinct taxa. I am not judging this too harshly: The species involved is extinct, and the book is not intended as a field guide in any event. Along the way, Kim absorbed a tremendous amount of information about the how and why of bird feather coloration: The iridescence on the neck and back of the Superb Starling comes not from pigment, but from structural color. Along with a foreword by John W.
She went back and redid the tail feathers in the correct position. These larger sections are divided into subsections, addressing a wide variety of topics. Using the Great Cormorant as an example, Kim walks through her process step-by-step, showing us the graphite study, the initial underpainting on the wall, filling in that underpainting, and finally, the finished bird. The mural celebrates not only the wonderful diversity of birds, but their evolution as well. Turacos are an exception, displaying a green, copper-based pigment called turacoverdin that they absorb in their herbivorous diet. 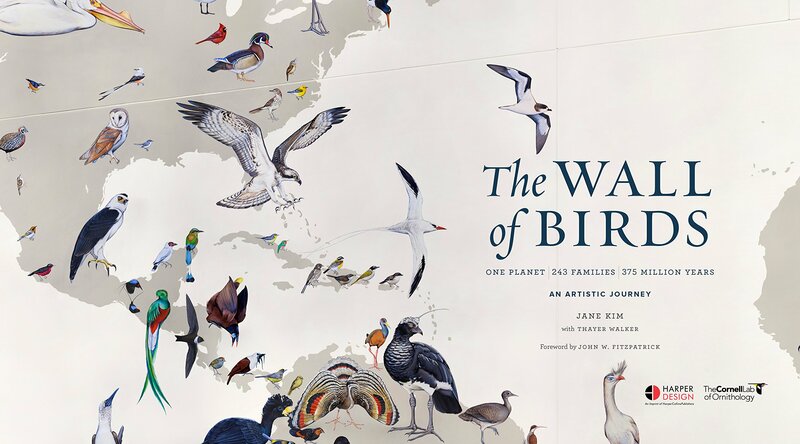 Fitzpatrick, director of the Cornell Lab of Ornithology, and full of lush photographs of gorgeous life-size birds painted in exacting detail, The Wall of Birds lets readers explore these amazing creatures family by family and continent by continent. 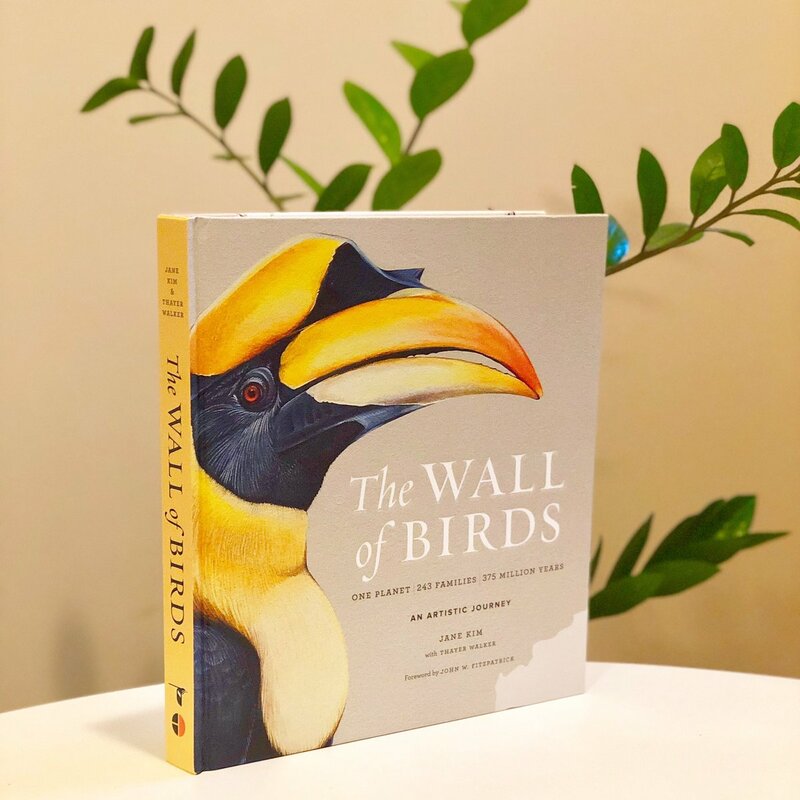 From the tiny five-inch Marvelous Spatuletail hummingbird to the monstrous thirty-foot Yutyrannus, The Wall of Birds is a visual feast, essential for bird enthusiasts, naturalists, and art lovers alike. Fitzpatrick, Director of the lab, and a short introduction by the artist, The Wall of Birds comprises seven major sections, six defined geographically and the seventh dedicated to the evolution of birds. Depicted off the coast of Brazil, the Magnificent Frigatebird is the only figure in the mural to incorporate an architectural feature from the wall, gripping a sprinkler head as a perch. On three pages you can see the entire wall in all its glory. These early stages made up the bulk of the work: Kim estimates that only 5% of the process was the actual painting of the final images on the wall. Fitzpatrick, director of the Cornell Lab of Ornithology, and full of lush photographs of gorgeous life-size birds painted in exacting detail, The Wall of Birds lets readers explore these amazing creatures family by family and continent by continent. This particular edition is in a Hardcover format. It is still well-worth having, if not strictly as an art book, then certainly to read. See her onstage in New York City February 11 for Theater of the Apes book-based variety show,. She even shows examples of 53 colors she used, from Cassowary Black to Albatross Light. Some, like Flamingo Pink, were so unique I used them only once. Thankfully, in The Wall of Birds Kim gives us much more than artwork. Anyone who travels to Cornell to see it will appreciate the incredible amount of thought and research Jane Kim and her collaborators devoted to this project. New Book Used Book Cheapest Book How long of a rental duration do you need? The mural depicts one member from each of 243 bird families layered over a map of the continents and oceans; some of the extinct ancestors of modern birds are also shown. Kim presents the birds of the mural, along with natural history information and extensive insight into its creation in a more prosaic format, a book —. 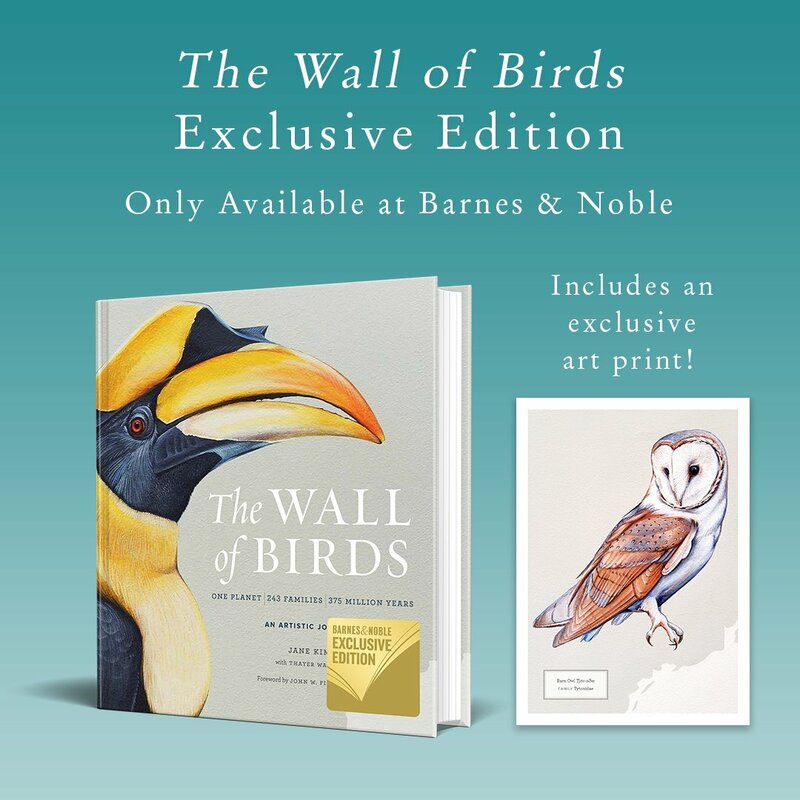 From the tiny five-inch Marvelous Spatuletail hummingbird to the monstrous thirty-foot Yutyrannus, The Wall of Birds is a visual feast, essential for bird enthusiasts, naturalists, and art lovers alike. So where does that leave? Birds have no green pigmentation; in most cases, verdant plumage is a combination of yellow carotenoids and blue structural color. The emperor pays him no mind. For example, the Wood Duck and Prothonotary Warbler on pages 190-1 really pop. Synopsis A celebration of the diversity and evolution of birds, as depicted in the Cornell Lab of Ornithology's magnificent 2,500-square-foot Wall of Birds mural by artist Jane Kim. I did find one error in the book, when a written description in the text refers to the wrong illustration. From the opening of the Imogene Powers Johnson Center for Birds and Biodiversity at Cornell in 2003, Fitzpatrick had proposed a mural project to other artists, but it was not until early 2010 that he found one courageous enough to take up the challenge. Europe has no endemic bird families, and much of Asia lies at high latitudes with low bird diversity. The book finishes with a catalogue of the birds illustrated, information about the lab, a selected bibliography, acknowledgments, and brief biographies of Kim, Walker, and Fitzpatrick. The birds are set against a greyscale map of the world, and while many are depicted in flight, every one save the Wandering Albatross has a foot touching its continent of origin. Exactly — create a huge mural featuring 243 life-size birds, one from every family. A palette of thirteen supplied the jewel-toned accents so thrilling to birdwatchers. Part homage, part artistic and sociological journey, The Wall of Birds tells the story of birds' remarkable 375-million-year evolution. All in all, The Wall of Birds is an extremely enjoyable look inside the creation of this beautiful and massive mural. In addition to the 243 birds from current families, Kim shows 26 extinct creatures, both birds and select ancestors, without the color that graces the extant birds. She works for a gallery in the Chelsea art district, and is an active member of the Brooklyn Bird Club and the Linnaean Society of New York. That becomes obvious upon unfolding the gatefold at the end of the book. Fitzpatrick, director of the Cornell Lab of Ornithology, and full of lush photographs of gorgeous life-size birds painted in exacting detail, The Wall of Birds lets readers explore these amazing creatures family by family and continent by continent. She spent the first year consulting references and producing rough studies and sketches, which were then reviewed with Cornell staff before she completed more detailed templates. The Wall is organized geographically, with the birds superimposed on an in-scale map of the world, roughly within their natural range. She provides insight into the design of the mural, including the selection of species and their placement on the wall. What would you do with that? But then a few pages later, other North American representatives are downright dull. With a foreword by John W.
Sometimes there is a cluster of birds exactly as they appear on the wall, other birds are presented singly in greater scale, some even full or larger-than-full page. In one such case, Kim mentions that she made an effort to include female birds, which morphs to a discussion of women in ornithological art. Throughout, beautifully crafted narratives and intimate artistic reflections tell of the evolutionary forces that created birds' dazzling variety of forms and colors, and reveal powerful lessons about birds that are surprisingly relevant to contemporary human challenges. Regardless of scale, each is shown in exquisite detail. Artists will also find much of interest here. She also talks in detail about a few certain species, such as the marvelously unique Secretarybird.